Looking for a recommendation for a folding gut hook. I DON'T want it on a knife. I want a stand-along gut hook. It would be nice if it had replaceable blade option. I've looked at the Havalon Piranta, but I already have their Baracuda and it doesn't seem to come with a gut hook option. Hep? 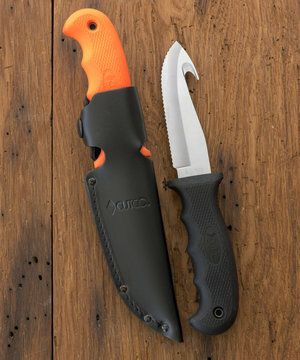 I’ve only quartered moose and the only tool that works well is the Outdoor Edge Zip-pro knife. Use it right and it slices through their tough hide like a hot knife through butter. I’ve tried hooked styles and none have worked on moose. The havalon multi tool has a gut hook built in. Outdoor edge makes a stand alone gut hook $18 on Amazon. They also make the replaceable blade knife with a gut hook folder. Raptor Razor is an awesome combo! I want to clarify that it is gut only. Thicker parts of hide and it doesn't work. On the gut and inside of leg, like opening a zipper. This is what I am using right now. I also have this one back in NY for whitetails. I found the Browning hook to be too small for moose hide. Hillary moved to NY and I moved out. Wyoming knife. Very good gut hook. Been using mine for about 40 years. It has replacement blades and the blades last a long time before getting dull. All times are GMT -8. The time now is 19:03.